Dacia announced today a new partnership. This time, the top version of Duster will be the official car of the George Enescu Festival. Dacia is a partner for six years with the Gopo Awards and with the Book Fair "Gaudeamus". This year, the George Enescu Festival will take place between 1 and 25 September 2011 in Bucharest. The association of Dacia with the prestigious cultural event organized by the Romanian Government – Ministry of Culture and National Heritage is a premiere. In addition to the transport of the personalities who will participate in this event, Dacia will also provide a Duster 4×4 for Ioan Holender, the director of the festival. 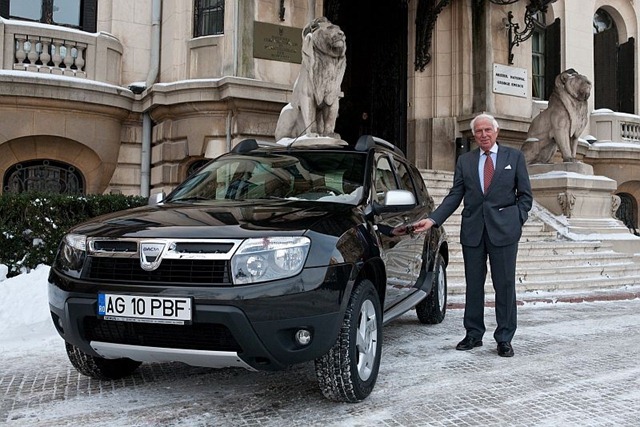 Ioan Holender will use the Dacia Duster for his trips in Romania to organize the Bucharest event. "The festival is one of the strongest brands in Romania. It promotes not only the work of the greatest Romanian composer, inspired by Romanian folk music and influenced by French music tradition, but all the cultural activity in Romania. Dacia is proud to be associated with such a great event. Through their international vocation, both are brands that Romanians can be proud" said Jérôme Olive, the general manager of Automobile Dacia and Renault Group in Romania. "We wanted to bring at this anniversary edition as many Romanian brands as we could. The festival is an exceptional opportunity to show the world what values exist in Romania and show the Romanians some international values. The presence of our most important brand, Dacia, is a proof that our festival is uniting what is representative in our time – creativity, resilience and competitive spirit" said Ioan Holender.